Dreams of dense, walkable cities with efficient public transportation filled my brain as I plotted my life after college. In addition to living in such a city—where I could hopefully commute without a car—my vision included securing a job that combined my love for technology and transportation. When I received the call for a position developing mobile applications at a transportation company, the decision seemed to make itself. The catch? The job was in Jacksonville, Fla.—the largest city by land area in the entire contiguous United States. To say the least, I would not be moving to a place where living without a car seemed even remotely possible. Not long after settling into life in Jacksonville, I was on a road trip with four of my closest friends. We were stopped in traffic on the interstate, when all of the sudden I looked in the rearview mirror to see a car spinning directly into us. Luckily, all parties involved were unscathed, but it totaled my car. Being posed with the decision of whether to purchase a new one forced me to grapple with the values I’ve been trying to uphold since first becoming passionate about urban planning and our country’s car culture. This is how, a week after the crash, I came to the conclusion that this was some sort of sign from the universe that I was done with owning my own car. To say that what women are expected to wear in your typical “business casual” workplace is not conducive to bicycling is a massive understatement. In the colder months, fitted pants are my staple (loose ones can get caught in the bike chain), while in the summer months I’ve learned to just simply rock bike shorts under a loose-fitting dress and own it. Keeping your team, coworkers and employer in the loop about your commute is key to making sure they understand why you might roll into the office with beads of sweat on your face or some bike grease on your calf (this happens to me about once a week). While some workplaces, including mine, may have gyms equipped with showers and areas to change, there’s something empowering about locking up your bike outside the office in a floral dress and ballet flats. I like to think it illustrates to others that being a bike commuter doesn’t have to require fancy gear, a lengthy outfit change or a whole new wardrobe. There’s a running joke within my friend group that I refuse to ever separate from my backpack, and it really isn't far from the truth. 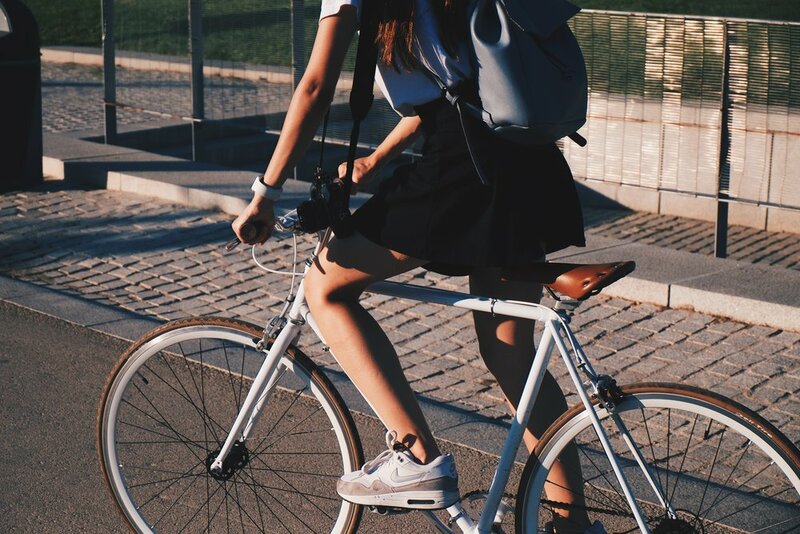 Backpacks are the perfect companion to a bicycle as they keep your hands free but still can hold extra clothes for yoga, different shoes to change into for work or a laptop to go work at a local coffee shop. Even grocery shopping is made easier when you have your hands free; I would be lying if I said I haven't biked home with broccoli sticking out of the top of mine. For a while, when I first started commuting via bicycle, coffee became an afterthought in my morning routine. People always rave about the after-effects of a morning workout, so having a form of exercise as my commute does wonders for productivity. Bike-commuting as a woman adds another layer to this burst of energy as well, as it is an incredible feeling to know that your own muscles, strength, and intelligence propelled you to your workplace. Susan B. Anthony said the bicycle did "more to emancipate women than anything else in the world," and it makes sense as to why. Requiring nothing but our own power, they can level the playing field for women of all income levels to be self-sufficient and have access to more opportunities. I can't help but smile when I roll out my own bicycle each day and think of the women who blazed the trail before me to make this lifestyle possible. Not having a car has taught me it’s OK to ask for help sometimes, too; you don't have to do it all on your own. From my roommate, who checks the weather radar to let me know when a storm is coming, to coworkers who always offer rides to team outings, I am beyond lucky to have the support system I do; I wouldn’t be as successful in this car-free venture without them. Continuing the open dialogue in our workplaces on what’s acceptable—whether it's flexible hours due to rainy afternoons in the summer, a team carpool for group events or even the understanding that some days I may roll in a bit sweatier than others—is important to building better workplaces. I wish I could say I've become an expert at using the city’s bus system, or that cars seem completely useless now. On the contrary, many of the challenges I’ve faced are that public transportation can be time-consuming, and there definitely are use cases for automobiles. With ridesharing and help from friends I’ve made it work, but I cannot say it was always easy. My younger sister will be going to college in the fall and has offered me her car to keep, just in case. At first, I was quick to resist and not buy into car culture again, but my family encouraged me to have access to one for hurricane season, outdoor adventures off the beaten path and road trips home. After much hesitation and discussion with friends, I agreed to this with the promise to myself that I would still continue to bicycle commute to work and only use the car in fringe cases. I would be remiss not to acknowledge the immense privilege of having my mode of commute be a choice. While this was a conscious decision I made, many people do not have the support system, autonomy or infrastructure along their routes to do the same. Unfortunately, being a woman can make it intimidating to consider braving a long commute without the protection of an automobile (hello, catcalling); employers may be unsupportive, or the route may be impassable without a vehicle. It’s important that we provide equal access to multiple modes of transportation to level the playing field for all genders, socioeconomic classes, races and ages. Six months of being car-free have taught me that for every sporadic rainstorm, expensive Lyft ride or 90-degree day, there are also incredible friends offering help, bike rides that push me out of my comfort zone (in the best way), and, of course, the total lack of gas or car payments. Bicycle commuting affirms your own strength and power, encourages workplaces to make alternative modes of transit an option and pushes cities to make accessibility a priority for all. To all my two-wheeled babes out there—whether aspiring or current—let’s get out there and show the world that bike commuting is for everyone. I’ll see you at the bike rack. Healy is a sunshine state gal through and through, who currently resides in Jacksonville, FL. She has degrees in urban planning + information technology and currently works as a software engineer for a transportation company. As a lover of the outdoors, in her free time you can usually find her going for bike rides, practicing yoga, reading a book in the park, or frolicking on the beach with her family and fluffy pup, Dolly. You can find more of her thoughts and explorations at urbanisthacks.com.